PAYMENT CREDIT UP TO $500!! 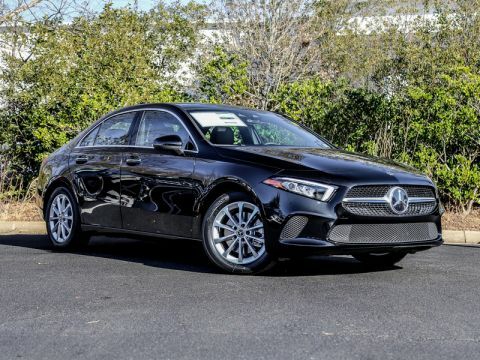 ALL NEW 2019 MERCEDES-BENZ A CLASS A220 4MATIC SEDAN IN COSMOS BLACK OVER BLACK MB-TEX LEATHER!! LOADED WITH PREMIUM PKG, 10.25" CENTER DISPLAY, 10.25" DIGITAL TOUCHSCREEN INSTRUMENT CLUSTER, KEYLESS GO, MBUX INTERFACE WITH VOICE RECOGNITION, MULTIMEDIA PKG, AUGMENTED VIDEO, NAVIGATION, TRAFFIC SIGN ASSIST, BLIND SPOT ASSIST, 17" WHEELS, HEATED SEATS, 64 COLOR AMBIENT LIGHTING, PANORAMA MOONROOF, REARVIEW CAMERA, AND MORE! !PAYMENT CREDIT UP TO $500!! 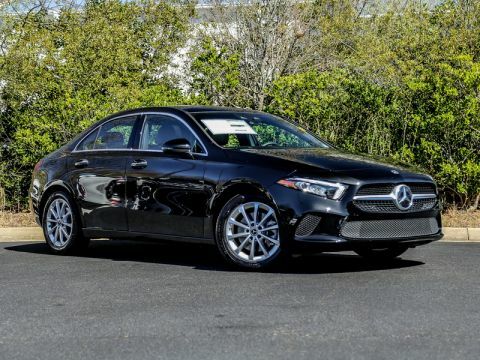 ALL NEW 2019 MERCEDES-BENZ A CLASS A220 4MATIC SEDAN IN COSMOS BLACK OVER BLACK MB-TEX LEATHER!! LOADED WITH PREMIUM PKG, 10.25" CENTER DISPLAY, 10.25" DIGITAL TOUCHSCREEN INSTRUMENT CLUSTER, KEYLESS GO, MBUX INTERFACE WITH VOICE RECOGNITION, MULTIMEDIA PKG, AUGMENTED VIDEO, NAVIGATION, TRAFFIC SIGN ASSIST, BLIND SPOT ASSIST, 17" WHEELS, HEATED SEATS, 64 COLOR AMBIENT LIGHTING, PANORAMA MOONROOF, REARVIEW CAMERA, AND MORE!! PAYMENT CREDIT UP TO $500!! ALL NEW 2019 MERCEDES-BENZ A CLASS A220 4MATIC® SEDAN IN NIGHT BLACK OVER BLACK MB-TEX LEATHER!! LOADED WITH PREMIUM PKG, MULTIMEDIA PKG, NAVIGATION, AUGMENTED VIDEO, TRAFFIC SIGN ASSIST, 10.25" CENTER DISPLAY, 10.25" DIGITAL TOUCHSCREEN INSTRUMENT CLUSTER, KEYLESS GO, MBUX INTERFACE WITH VOICE RECOGNITION, BLIND SPOT ASSIST, HEATED SEATS, 64 COLOR AMBIENT LIGHTING, PANORAMA MOONROOF, REARVIEW CAMERA, AND MORE! !PAYMENT CREDIT UP TO $500!! ALL NEW 2019 MERCEDES-BENZ A CLASS A220 4MATIC® SEDAN IN NIGHT BLACK OVER BLACK MB-TEX LEATHER!! LOADED WITH PREMIUM PKG, MULTIMEDIA PKG, NAVIGATION, AUGMENTED VIDEO, TRAFFIC SIGN ASSIST, 10.25" CENTER DISPLAY, 10.25" DIGITAL TOUCHSCREEN INSTRUMENT CLUSTER, KEYLESS GO, MBUX INTERFACE WITH VOICE RECOGNITION, BLIND SPOT ASSIST, HEATED SEATS, 64 COLOR AMBIENT LIGHTING, PANORAMA MOONROOF, REARVIEW CAMERA, AND MORE! !